After crossing Melide’s dam bridge, the train passengers will pass by a small station that precedes Lugano’s most important one, that is Lugano Paradiso. 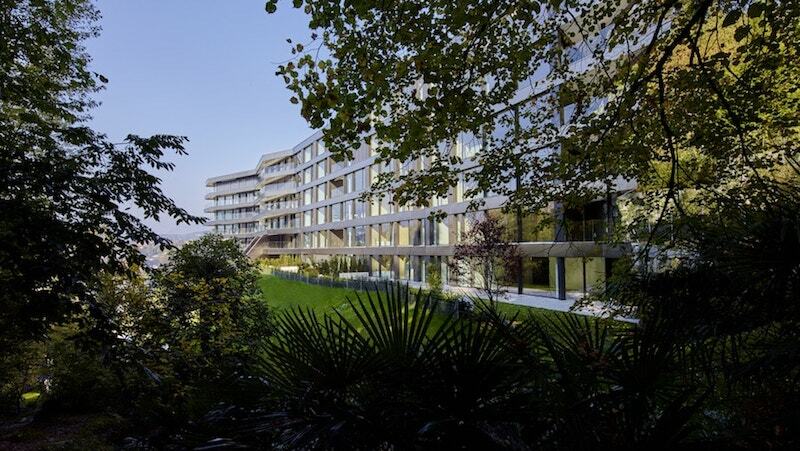 In the travellers’ eyes, this little piece of heaven, only a few kilometres away from the livelier town of Lugano, is a gem overlooking the lake. Paradiso, known as Calprino until 1929, is a separate municipality located in Lugano’s suburbs. 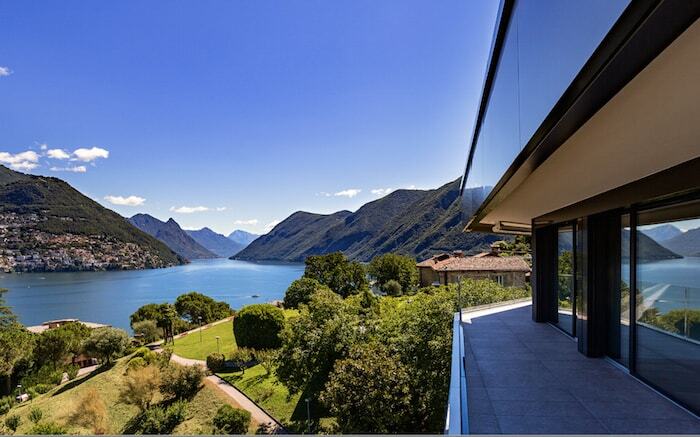 It has approximately four thousand inhabitants and is located at the foot of Monte San Salvatore facing Lake Lugano. 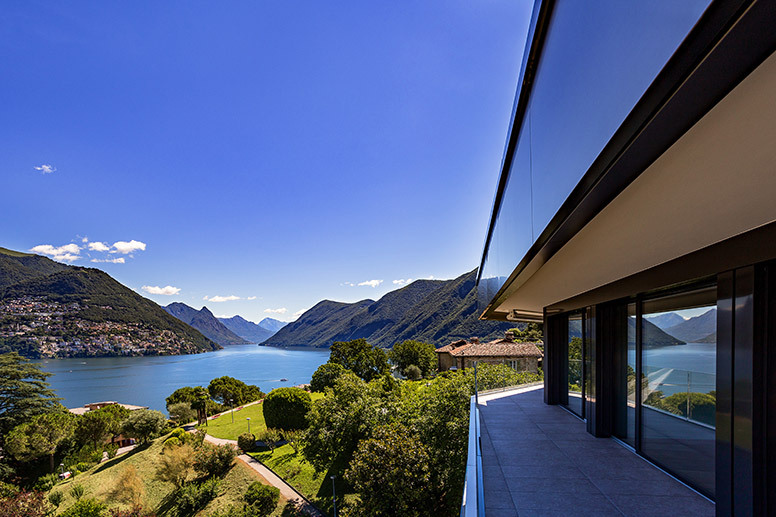 Paradiso is, in every way, a town that offers peacefulness and relaxation, but with a dash of elegance and charm, also thanks to the nearby town of Lugano. 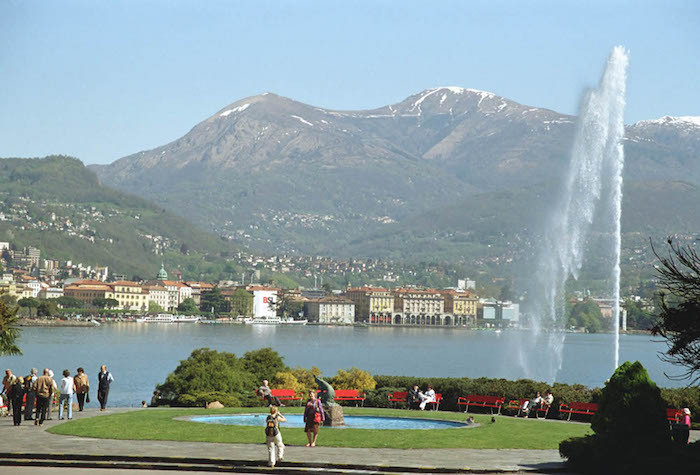 The municipality of Paradiso and its surroundings are the largest tourist hub in the Canton of Ticino because of the parks, the well-maintained green spaces, the villas and the churches. A pleasant Mediterranean climate is due to the town’s strategic position, as it is located in a cove on the north bank of Lake Lugano. 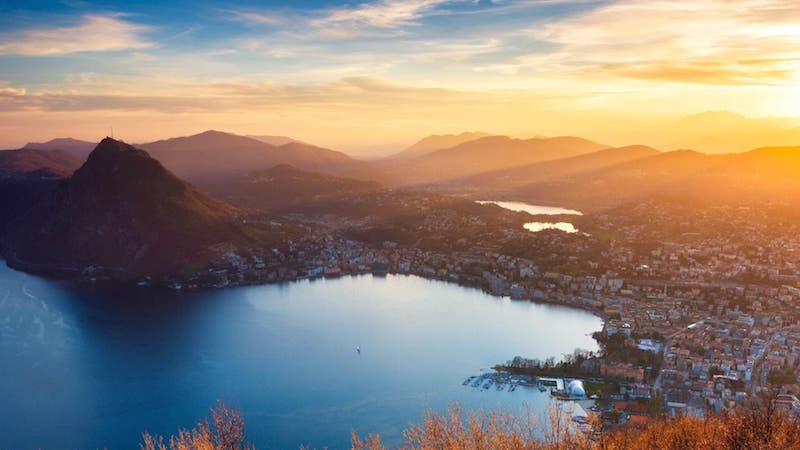 What is now considered an elite area around the town of Lugano up until the second half of the 19th century used to host a people that was mainly dedicated to farming and fishing. It was only when the Gotthard railway was inaugurated in 1882 that new perspectives opened for the town of Paradiso, that was starting to become a tourist destination. During this moment of growth, the Monte San Salvatore funicular was inaugurated in 1890. It’s one of the area’s main attractions and it still draws tourists from every Swiss canton and not only. In the early 13th century, pilgrims already used to walk up to the summit of Monte San Salvatore, also known as Lugano’s Sugarloaf Mountain. Since 1890, the funicular railway, that leaves from the municipality of Paradiso, has helped visitors cover the six hundred metre drop and reach the mountaintop. 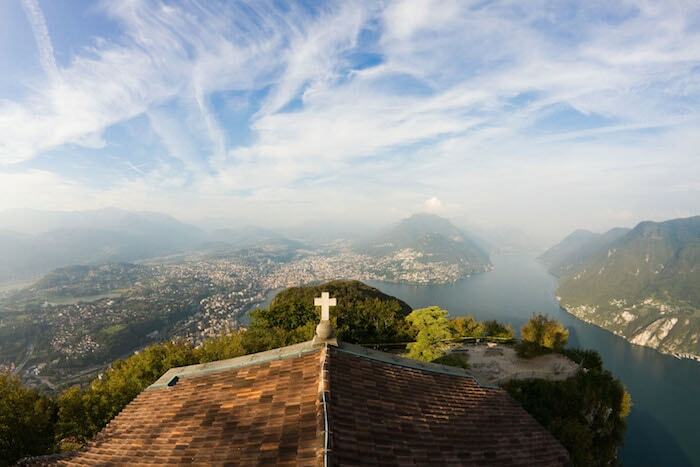 From the church roof, on top of the mountain, you can enjoy a breathtaking view and gaze upon the entire Southern Ticino from above. This stunning panoramic viewpoint, that frames the town of Paradiso, consists of dolomite rock formed millions of years ago at the bottom of the sea that occupied this area, which was once part of the primordial continent known as Pangaea. It was only when the tectonic plates moved that Monte San Salvatore emerged from the primordial sea. Traces of its past can still be seen today at the San Salvatore Museum, in the area dedicated to rocks, minerals and fossils. On the mountaintop, conference halls and a restaurant will allow you to make the most of your day and admire the natural beauties surrounding the municipality of Paradiso. A new panoramic terrace named “Terrazzino Capodoro“ was recently inaugurated near the restaurant. Facing south, it’s a crown jewel overlooking the lake. Moreover, let’s not forget about the via ferrata that allows those who are inexperienced to climb demanding rock faces thanks to specific equipment such as ladders, cables, iron anchor bolts and rocks. From the peak, instead of using the funicular, you can take one of the various trails leading to Paradiso; for the hardest one it takes no more than three and a half hours. These paths pass by the neighbouring villages, such as Carona, and will allow you to keep enjoying the charming view of the landscape surrounding Paradiso. The village of Carona offers another interesting place to visit, the Church of Saints Giorgio and Andrea. Adjoining the Municipal Loggia, the church dates back to the Roman age but it was first mentioned in manuscripts in 1425, when Pope Martin V proclaimed its separation from the collegiate church of Saint Lorenzo in Lugano, another interesting site for tourists and not only. Today, the church of Carona fundamentally looks like it did between the 16th and the 17th century, as at the end of the 16th century substantial changes were made in order to meet the parameters established by the Council of Trent. During the modern age, the church underwent a major restoration that involved the roof, the façades and its drainage channels that brought the church’s original colours back to life. Carona offers another stunning location on a hillslope overlooking a wide panorama, the San Grato Park, which hosts the broadest collection of azaleas, rhododendrons and conifers of the entire region. With a surface of two thousand square metres, it is definitely one of the must-see places near Paradiso. The park consists of six themed paths (botanical, relaxing, panoramic, artistic, fairy-tale and sensory) with information boards for the visitors. And finally, you cannot but round off a day in this beautiful place by dining at the panoramic restaurant. The municipality of Paradiso is currently an ideal location, not only for tourists, for practising sports and relaxing, but also for luxury residences. While walking down the streets, your gaze will probably fall upon charming recently-built apartments, with wide green areas and stunning views on the lake. Furthermore, its proximity to the town of Lugano, interesting both for its tourism and its commercial and financial activities, makes it a true little “paradise” (the name says it all, since “paradiso” in Italian means “paradise”), far from Lugano just enough to be surrounded by nature, but still near enough to be easily connected to it. The municipality of Paradiso definitely doesn’t lack infrastructures and means of transport, from the already-mentioned train station of Lugano-Paradiso, from which you can easily reach on foot the funicular leading to Monte San Salvatore, to the highway that quickly takes you to the town centre, to the cantonal road that runs along the lake and gives a charming view to travellers. Villas, parks, history, nature: Paradiso enshrines present and past, and treasures its origins (with the funicular that still takes tourists to the top of Monte San Salvatore), but at the same time it is focused in the present and projected into the future, especially as far as real estate expansion is concerned. 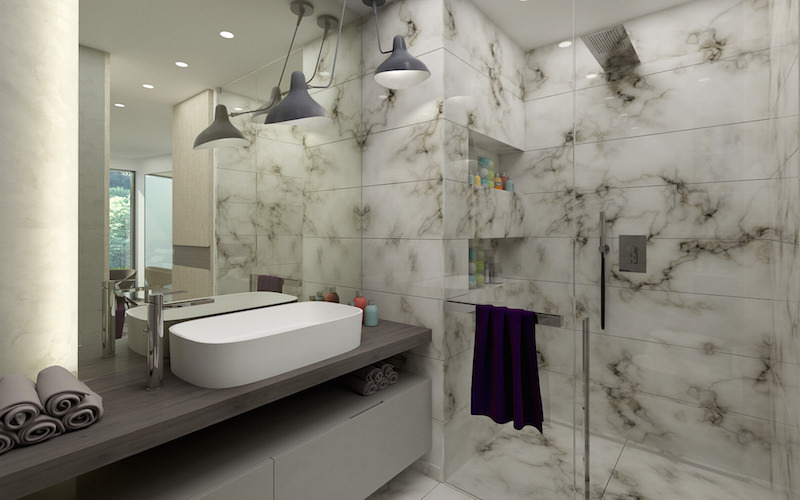 Here luxury and beauty meet nature and sustainable living.